Since Cold Fusion / LENR is hydrogen based, it makes sense that if this LENR shall ever be the energy source of the future (which we know it shall be) then the hydrogen economy we’re always hearing about shall also become a reality one day. It is important therefore to take a look at Hydrogen as an enabler of the Coming Energy Revolution. Hydrogen is so important that even the USA Department of Energy (DoE) recently provided $20 Million in funding for research on Hydrogen production alone. Currently, hydrogen production is expensive, not environmentally friendly, and makes no economic sense since it requires way more energy to produce a gallon of hydrogen than the energy content of the hydrogen produced. Hydrogen today is neither a green energy source nor is it’s use sustainable. Storage is also a problem but when it comes to LENR, which operates at nuclear scale energy levels, storage will not be an issue at all: just consider that 1 gram of hydrogen can power an entire house for over a year and you’ll understand what I mean. Both storage & transportation will not be a factor in the future. 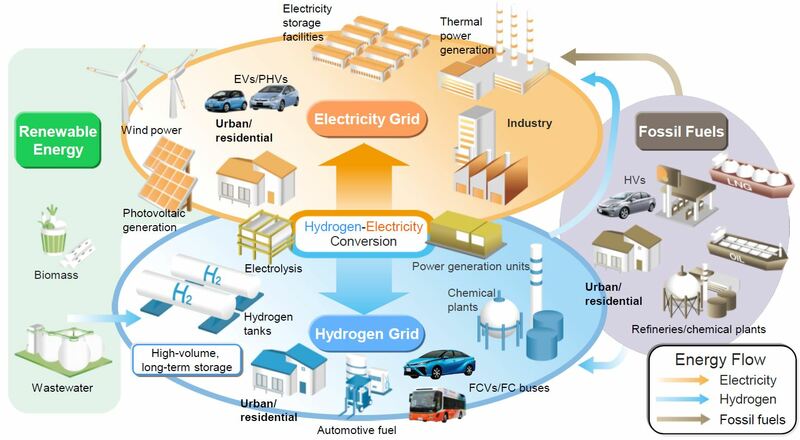 While most hydrogen generation is done on a large scale at a central location, both distributed & localized hydrogen generation would reduce costs and provide a reliable fuel supply by producing hydrogen where its needed, like in electric cars, homes, & offices. At the moment the dominant method for production is what’s called steam reforming from hydrocarbons, where large industrial quantities are produced by heating natural gas (methane) mixed with water steam to separate the hydrogen from carbon. The use of fossil fuels (gas) erodes the renewable/green advantage of hydrogen. This steam reforming is done with an 80% efficiency and accounts for 95% of all hydrogen produced in the world. Many other methods are also used, particularly electrolysis (and you’ll never guess where the largest electrolysis plant in the world is located: Zimbabwe) but unfortunately electrolysis is just not cost effective. What’s the point of using 100MW of electric power to separate water into 100 gallons of hydrogen & some oxygen, then recombine (in a fuel cell) that 100 gallons of hydrogen with some oxygen to form water once again and produce only 1MW of electric power? The key is to develop processes that produce significantly more hydrogen gas than the energy used to extract the hydrogen. Hydrogen production is an estimated $100 billion industry but the cost factor and the fact that 95% of it is from a non-renewable energy source; i.e; the natural gas found in petroleum oil wells, probably negates the benefits of its production. Other novel techniques of hydrogen production being investigated involve imitating nature to do artificially what nature does so well, i.e; photosynthesis. Plants are able to naturally separate the oxygen & hydrogen atoms in water in the presence of sunlight so scientists are hoping that artificial photosynthesis using solar / photovoltaic cells will one day accomplish the same thing, but this process has so far proven to be complex and expensive, notwithstanding the well documented low efficiencies & high costs of solar. Additionally, Materials used for artificial photosynthesis often corrode in water anyway. The biological processes for making hydrogen are almost all in the early stages of development and could in the near future be practical for large-scale use. One example is the use of algae, in the absence of sulfur, to produce hydrogen instead of the oxygen it would normally produce under natural conditions. However, there’s a biological process with even greater potential: the use of specialized genetically modified bacteria and some fascinating microbes found in… wait for it… termites. In fact, a collaboration of researchers from the DoE’s Joint Genome Institute & Caltech has already sequenced and analyzed microbial DNA extracted from the guts of hundreds of termites. 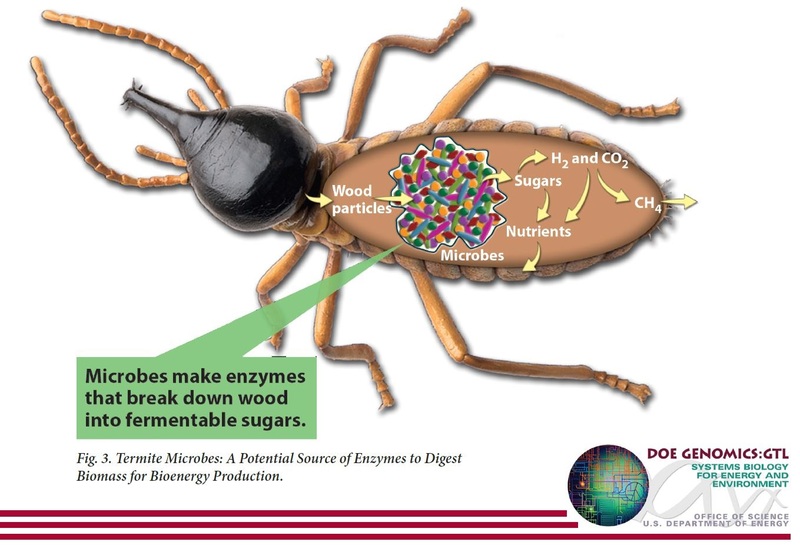 Everybody knows termites are very good at damaging furniture and consuming wood, but few know that they contain special enzymes & microbes within their small tummies that enable the digestion of all their ingested cellulose, excreting hydrogen as a waste product. Termites are so good at making hydrogen that they can convert 1 gram of wood or paper to 10 litres of hydrogen. So it is actually possible to isolate these microbes and create a bio-refinery. The goal isn’t to create a reactor full of termites and out comes hydrogen. The goal is to determine the microbiome of the termite gut, understand and model their interactions, then recreate an ‘artificial’ termite gut that functions without the need for termites. Although there are several methods for biohydrogen production such as those mentioned above, biohydrogen may be produced through either photosynthetic means like the algae example, or the fermentation process. In general, fermentative hydrogen production is more efficient than photosynthetic and can be equated to the production of alcohol by the fermentation of grapes (wine), barley (beer), potatoes (vodka), etc. The major difference being that instead alcohol as the end product, we get Hydrogen instead. Take the dreaded Escherichia Coli (E. coli) bacteria for example. It’s so well understood that its entire genetic code has been sequenced and the Genetic manipulation of E. coli is also very easy because scientists know exactly what genes to switch on or off and the exact resulting effects. It ferments glucose into hydrogen and is capable of producing about 3 times as much hydrogen output per unit of input glucose/glycerol. Because glucose is so cheap, abundant, & easy to make, the entire process is very renewable & cost effective. All in all, the biological process has the highest hydrogen-production rates. It is also the most energy & cost efficient, the most environmentally friendly & sustainable. Time will tell what the dominant hydrogen production methods shall be in our future, but I’ll put my money on the biological process. This entry was posted in Uncategorized and tagged Bacteria, Cold Fusion, Electrolysis, Hydrogen, hydrogen production, LENR, Termite. Bookmark the permalink. Nice blog. Good to see some focus on hydrogen energy, cold fusion and related energy topics. Keep up the good work. Sources??? as far as I can see this is all plagiarized unless you did these studies yourself which I highly doubt. Stop giving credible science a bad name by not citing your info!! Nikki, what are you talking about? Please show me the plagiarism? It’s research, which means I get info from others and present to my audience the way i feel best, providing my own personal opinions and analysis on the subject. Nowhere did i claim these studies where done by me. Sources are clearly provided.